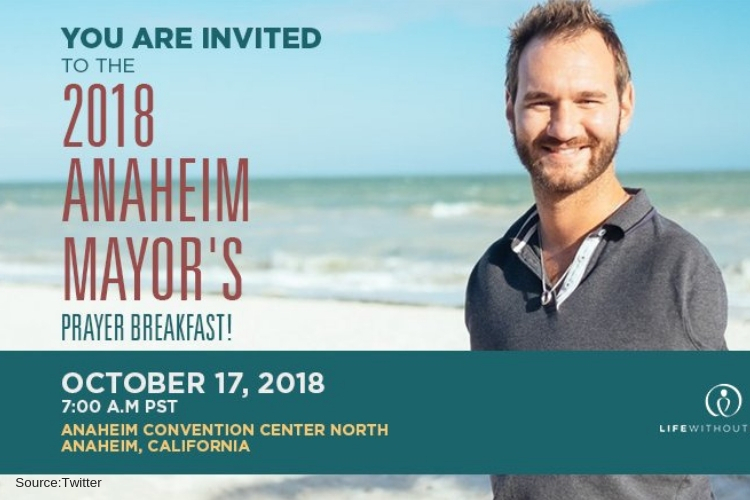 Early this morning many gathered together in faith and community to pray together in Anaheim at the annual Mayor’s Prayer Breakfast 2018, the gathering was held in a banquet hall of the Anaheim convention center. I had the great opportunity to attend the breakfast and was moved by all the speeches given and the music played. Featured this morning was keynote speaker Nick Vujicic with music by former American Idol and performer on Ellen and the Today show Colton Dixon and of course readings from local community members. Special thanks to the host Mayor Tom Tait and the city of Anaheim will surely miss you as their mayor. To start of the morning the crowd was led with the Pledge of Allegiance and posting of colors conducted by St. Catherine’s Academy. Based out of Anaheim, St. Catherine’s is a Catholic-based school with a military tradition serving the community since 1889. The students are held to a high respect among the community and did a wonderful job this morning. Staring off we all were given a mixed cup of fresh cut fruit which then lead to breakfast was served right after, people indulged themselves with a spinach and egg quiche with sides of perfectly peppered bacon and tender cooked sausage and a light portion of scallop cheesy potatoes. Anyone would have loved to start there early morning with this breakfast. After I inhaled the perfectly cooked meal people began to settle back down in their seats preparing for the life-changing speech From Nick and moving music from Dixon. As Dixon sang his powerful message filled the room, capturing the ears and hearts of his listeners. He sang 3 songs with such grace and crushed his performance at the 2018 Mayor Prayer Breakfast. Vujicic was born 4 December 1982, he is known for being an Australian Christian evangelist and motivational speaker born with tetra-amelia syndrome a rare disorder (called phocomelia) characterized by the absence of arms and legs. He is one of the seven known individual’s planet-wide who lives with the syndrome. Nick’s personal story is so unique it allows him to touch the lives of children, teens, and adults of any nationality and from various backgrounds, he is able to speak into the lives and hearts of many with little hesitation! He talks about healing many sick and addicted individuals through his teachings traveling across the world to deliver his messages.No way do his abilities diminish his will to inspire and spark the flame of hope in people’s lives. In his speech, you see how his faith radiates through him so penetratingly that people including myself are literally captivated and disarmed when you see how genuine he rejoices in his circumstances. The moving message makes the average individual take a second and be thankful for what they have. As the breakfast came to an end we were read a passage from the New Testament by George Gilliam a music therapist and executive director of the Creative guitarist. Closing with the Old Testament by Paul Margeson a director of the Dayle McIntosh Center in Anaheim, a non-profit organization that supports the efforts of people with disabilities to live independently. The Lord’s prayer was given to conclude the moving annual breakfast of 2018. Anaheim came together as a city today, with a large amount of business and corporations sponsoring this year’s Mayor Prayer breakfast, I am honored to have been a part of such a huge gathering and touching message. Special thanks again to Mayor Tom Tait, Keynote speaker Nick Vujicic and musical performer Colton Dixon, and everyone who was able to attend this year’s breakfast. See you next year Anaheim.